The teddy bear that was previously named Muhammad by schoolchildren was today sentenced by judges in Khartoum for its part in the controversy that led to the imprisonment of English schoolteacher Gillian Gibbons. The bear, formerly known as Muhammad, has been sentenced to be flogged on ‘eBay Sudan’, with no expectation of a reserve. Postage and packing has been set at a stinging £400 however the bear is likely to be simply placed in a cardboard box and lashed with bubble wrap. A statement from the Unity High School in Sudan, where Ms Gibbons worked, said that there had never been any complaints over other toys that have been named by the children. 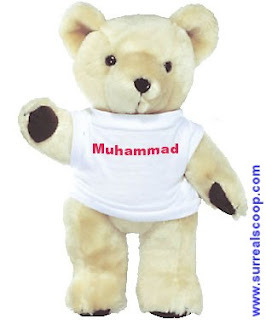 The Sudanese government denied its decision to flog the teddy bear, previously known as Muhammad, was cruel or malicious. Feelings are running high in Sudan’s capital Khartoum with protests on the streets, determined to ensure that true Islamic law is followed in the case of the Teddy Bear Formerly Known as Muhammad. What happene dto the bear in the end? I want to know.